Let's go make some fantastic pancakes! Combine lightly beaten egg with 1 C milk and 1/4 tsp vanilla extract and mix well. In a separate blow fully combine 1C flour, 1/2 tsp salt, and 1 tbsp baking powder. Add wet ingredients to dry and stir together just until fully blended. Add 1 tsp melted butter and stir just until blended (at the same time, add any diced or sliced vegetables and/or fruit). 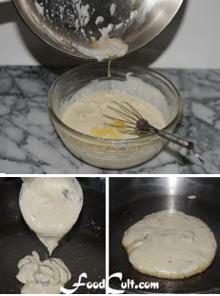 dispense batter onto a well greased/buttered cooking surface (Sufficient butter to prevent sticking). Turn only once - when the surface begins to bubble. Vanilla is an optional ingredient but we always use it. It works (when used in small amounts) as a flavour enhancer. Too hot and your pancake will burn. Too cool and it sticks. Learn your cooking surface. There are no limits to the flavours you can add to a batter. We like a tablespoon or two of maple syrup mixed into the batter along with a diced, in-season apple. 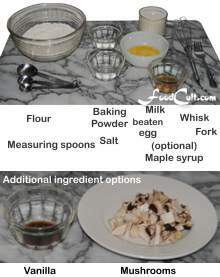 Try substituting some yogurt or sour cream for some of the milk - wonderful! Stir in last ingredients gently. Over-beaten batter makes tough pancakes! Pancake: pan-cake, n. A flat cake of batter fried in a pan. Akin to the griddlecake (a flat cake of batter fried on a griddle) or a "flapjack" which, some might argue, is chewy and made with rolled oats. We commonly know these three to be the same thing. Even the "crepe" is simply a pancake. The French Crepe is that beautiful thin-batter pancake that we enjoy so much with any range of wonderful fillings! Crêpe is, simply, French for "pancake". Still, for many of us, though, these are all the same thing. Your pancake can be made with any range of flours. You can even mix flours. 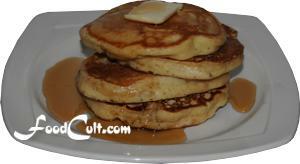 We use, for pancakes, organic flours - never added gluten. Sometimes we make light, whole wheat pancakes. You can use many ingredients. We like to subsititute some of the milk with yogurt, so instead of a cup of milk we will use 1/2 cup yogurt and 1/2 cup milk. You can also do fun things with this breakfast classic, the pancake. Dice some apple or mushrooms ... or wash some blueberries. Dry them then toss them into your batter for a delicious blueberry pancake! Pancakes can be a wonderful way to introduce extra fruit into your breakfast. This recipe makes approximately 7, 2 fluid ounce pancakes. The actual number of cakes will depend upon the size of your scoop. What's better than organic, homemade butter? Nothing! Click Here to learn how.